As the East Coast heatwave continues to bake New York, sitting somewhere cool with a good book seems like the ideal activity. So, we decided it's a good time to revisit our occasional Friday series, Recommended Reads, where we review books of interest to children and young adults. 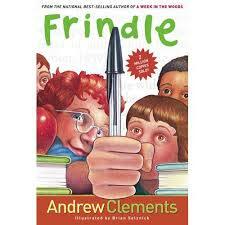 Today's book is Frindle, by Andrew Clements. Plot: Nick Allen, our hero, doesn't fall into any of the usual categories at school. He isn't a bad kid, or a particularly brilliant kid. Instead, he’s known as the kid who has lots of great ideas and isn't afraid to explore them, even if it means shaking things up. When Mrs. Granger, his fifth grade language arts teacher, tells the class that words mean what they mean because people say they do, Nick decides to test this idea by inventing his own word. Before long, all of his friends are using Nick’s word, saying “frindle” instead of “pen.” Soon the whole grade is using Nick’s word. Then it’s all over the school! The word starts an all-out war between Nick and Mrs. Granger, who has the deepest respect for the sanctity of language and bans “frindle” from the school. But the word’s popularity is such that Mrs. Granger, and even Nick himself, loses control of it. Nick’s word is soon in the local news, then on national television! Readers will love this realistic fantasy that shows the power of a simple idea. The end of the book is immensely satisfying and heart-warming. Our Take: As lovers of vocabulary and language, we are impressed by this simple story’s ability to make big questions about linguistics accessible to youngsters. We’re also fans of the book’s main characters. Nick is realistic and likable, and Mrs. Granger is the kind of English teacher some adult readers will remember fondly and others will wish they’d had. Her mastery of English is deep and passionate, and she’s sharp as a tack and tough as nails. At the same time, she demonstrates that she truly understands and cares about young people and occasionally betrays a delightful sense of humor. The path of Nick’s word, which is soon used all over town, gets him on talk shows, becomes an international sensation, begets a line of products, and is eventually adopted into the dictionary, seems far-fetched, but the spread of “frindle” mirrors the way new language is adopted in the real world. Author Andrew Clements, through Mrs. Granger, shares with his readers the widely accepted anecdote of the creation of the word “quiz,” allegedly invented by Irishman Richard Daly in response to a bet that he couldn't spread a nonsense word of his own invention through Dublin in 48 hours. Nick unconsciously follows in Daly’s footsteps. The success of Nick’s word leads him to be a bit humbled by the power of his ideas, but he’s not cowed for long and soon puts his knack for thinking up and implementing his thoughts to work in other ways. (After learning about supply and demand in his history class, for example, he uses the principle to rally his classmates and ends up improving the quality of food in the school cafeteria.) We were pleased, by the way, to note that while Nick is certainly an out-of-the-box thinker, he is always careful to follow established rules and to be respectful to the adults in his life. Parents and teachers will love this book because it is an introduction to sophisticated themes. Students will love it because it is a great story. But be warned: It just might start young readers hatching some revolutionary ideas of their own.